A statement said officers confiscated “weapons and fireworks” during disturbances close to the Johan Cruyff Arena. 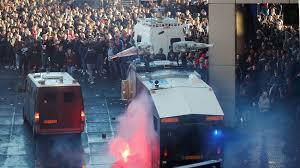 Water cannons were also used after violent clashes broke out between supporters and Amsterdam Police. Forty-six fans were arrested in the metro, 61 were initially arrested at the stadium, and a further 30 later at the stadium. “The police carried out many arrests on Wednesday 10 April prior to the Ajax-Juventus match. Two large groups, in particular Italian supporters, have been arrested,” the statement said.